Have to admit that when I look at other food blogs I am often jealous of the beautiful photography I see there. While my food staging and picture taking skills have improved over the months, I am still a novice, and not nearly as good at this as I’d like to be. 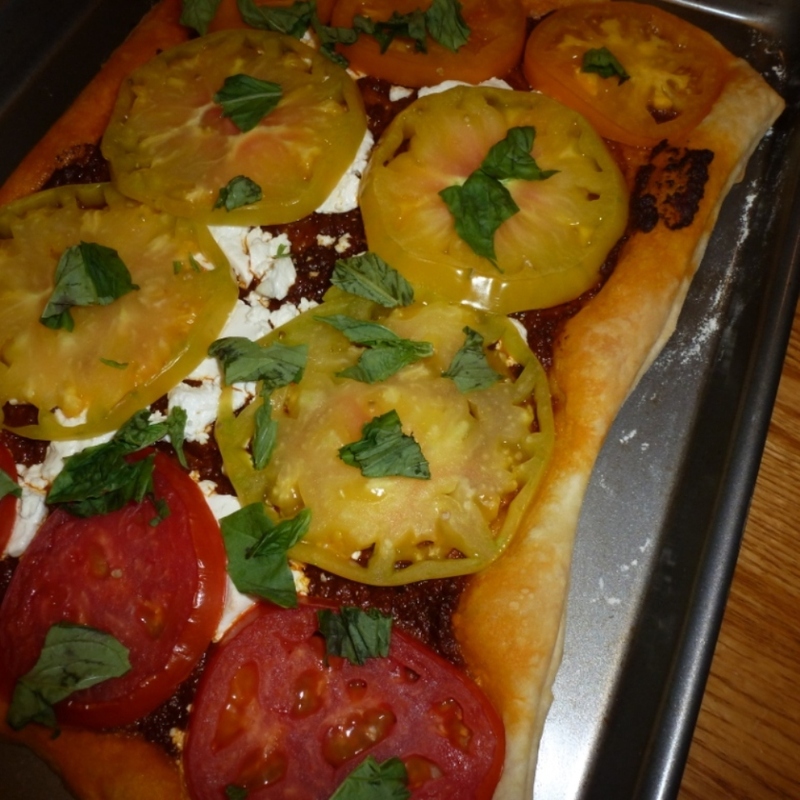 Case in point is this Heirloom Tomato and Goat Cheese Torte I made for my wife’s birthday dinner. The photos I saw of this on the Just a Taste blog made your mouth water, and as soon as I saw them knew I had to add it to the menu. I have to say that mine came out pretty darn good; just don’t think my photos did it justice. For something that looks at elegant as this it is amazingly easy to make. Simply buy a package of puff pastry (found in the frozen foods isle), spread store-bought (or homemade) pesto on top of the pastry, scatter some goat cheese on this, and finally layer sliced tomatoes on top. Using different color heirloom tomatoes gives it great ‘curb appeal’, but in a pinch ripe red tomatoes would work as well. One mistake I made was in my haste to put this together I forgot to put parchment paper down on the cookie sheet before assembling the torte. As a result some of the pastry crust stuck to the sheet. Looking back at the beautiful photos on the Just a Taste blog I see the underlying parchment paper. Just wish I had looked closer BEFORE I made this. Another lesson learned in my evolution. This entry was posted in Side Dishes and tagged tomatoes on September 6, 2013 by Bob.